The prestigious literary magazine Jornal de Letras describes Andreia Pinto-Correia’s compositions as “a major contribution to the dissemination of Portugal’s culture and language, perhaps a contribution larger than could ever be imagined.” Her music — described by the Boston Globe as “compellingly meditative” and by the New York Times as an “aural fabric” — is characterized by close attention to harmonic detail and timbral color. Following a family tradition of scholars and writers, her work often reflects the influence of literary sources from the Iberian Peninsula and beyond. Honors include a 2015 John Simon Guggenheim Memorial Foundation Fellowship and commissions from the European Union Presidency, League of American Orchestras and the Toulmin Foundation, Chamber Music America, Fromm Music Foundation at Harvard University, Boston Symphony Orchestra Brass Quintet, American Composers Orchestra at Carnegie Hall, Tanglewood Music Center, Albany Symphony Orchestra, National Symphony and National Dance Company of Portugal, and Culturgest/National Bank of Portugal, among others. Her work Timaeus, a concerto for orchestra commissioned by the Boston Symphony’s Tanglewood Music Center in memory of Elliott Carter, was recently premiered at the opening concert of the Festival’s 75th anniversary. Her works have been performed by the Minnesota Symphony Orchestra, Berkeley Symphony Orchestra, Calouste Gulbenkian Foundation Orchestra, Orquestra Metropolitana de Lisboa, and the Borromeo and the Mivos String Quartets. 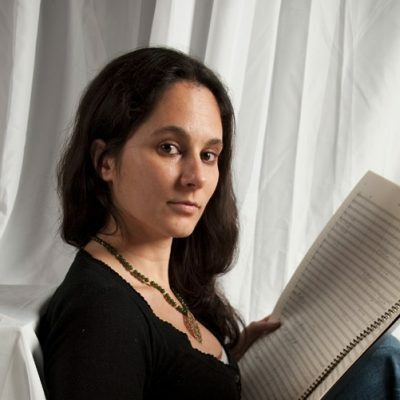 She has also been the recipient of a League of American Orchestras/ New Music USA Music Alive Composer Residency, a Rockefeller Foundation Center Fellowship, a Civitella Ranieri Foundation Fellowship, the Alpert Award in the Arts/Ucross Residency Prize, and the Toru Takemitsu Composition Award by the Japan Society. In addition, she was the curator of the Fertile Crescent Festival for Contemporary Music at the Institute for Advanced Study in Princeton. She has collaborated with an array of artists including filmmakers Salomé Lamas and Daniel Blaufuks (Portugal), writers Mia Couto (Mozambique), Ondjaki (Angola), Betty Shamieh (Palestine/USA), João David Pinto Correia (Portugal), and choreographers Omayra Amaya (Spain/USA) and Victor Pontes (Portugal). Born in Portugal, Ms. Pinto-Correia began her musical studies in her native Lisbon and received her Masters and Doctoral of Music degrees with Academic Honors from the New England Conservatory of Music as a student of Bob Brookmeyer and Michael Gandolfi. She attended the Minnesota Composer Institute, the European Network of Opera Academies (ENOA), the American Opera Projects (AOP), the Composers Conference, and the Tanglewood and Aspen Festivals.